I am a sucker for a dinosaur. Always have been, since childhood, despite that it wasn’t “cool” for little girls to dig dinosaurs (or stars for that matter). I remember the acute terror felt at going to see the first installment of Jurassic Park in 1993 as the T. Rex stepped onto the screen, the surround sound blaring and shaking my frame as that monster tormented those two kids in the Jeep. It was terrifying and fantastic all at once, and played right to my sense of dino-wonder. It was a success, so it got what all successful movies received: a half-baked sequel. 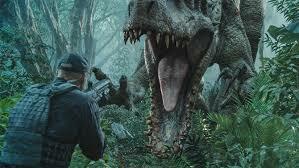 I did not love The Lost World: Jurassic Park, but damned if I didn’t go to the theatre to see it. The third one was just plain stupid, but again, I watched it because dinosaurs. Once we hit Jurassic World, I was ready for something new. The result? A decent enough thrill ride, but really, you can’t help but wonder: who on earth is dumb enough to keep bankrolling this place after the first three massacres? The answer lies in equal parts stupidity and greed, by both the characters and the producers. The simple fact is that these characters fall perfectly in line with the way that people behave in their misguided need to play King of the Mountain. Whereas the first film was more so governed by a love of science, the second and third films saw individuals that kept returning to the island as a way to try to conquer the dinosaurs – in essence, to assert their dominance over something ancient, whether it was a guided tour or the promise of more science if someone could just get one quick glimpse of something naturally forbidden. Jurassic World is no different in this aspect: the dinosaurs are all fairly neutered, from their literal inability to reproduce to their status as oversized zoo attractions. 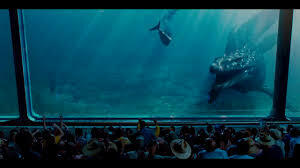 Really, it’s no better than SeaWorld at some points, and yet the audience is thrilled because they get to see something that could potentially kill them subdued and performing for them; in this respect, they dominate, even if it’s not a completely natural environment. This need is typified by Henry Wu (Benedict Wong)’s speech: “You act like we are engaged in some kind of mad science, but we are doing what we have done from the beginning. Nothing in Jurassic World is natural. We have always filled gaps in the genome with the DNA of other animals, and if their genetic code was pure, many of them would look quite different but you didn’t ask for reality – you asked for more teeth.” The folks in this universe accept the notion of possibly becoming the latest in a chapter of mass death event because they want to feel like the top of the evolutionary chain, whether they want to admit to that bargain or not. Yeah, this totally looks like a good idea. Let’s not forget the other reason why this sequel has been allowed to happen: money. 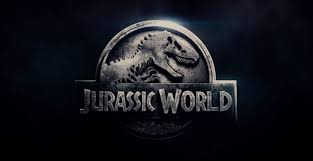 Much like the producers of the film hoping to get their hands on the hard-earned cash of movie goers, the investors and team behind the fictional Jurassic World funciton under the same principles. Claire (Bryce Dallas Howard) tells Owen (Chris Pratt) at one point, “We’ve been pre-booking tickets for months. The park needs a new attraction every few years in order to reinvigorate the public’s interest…. Corporate felt genetic modification would up the wow factor.” Anyone with a shred of common sense could tell you that the notion of genetic modifcation would be a bad idea as a best-case scenario. In fact, we’ve had at least three instances where this was proven. What happened in the first film? Corporate greed led to death. Second film? Spliced genes led to dinosaurs reproducing and killing everything in sight. Third film? More death. However, there’s money to be made, and as Claire romances potential investors, she pitches a good sell: they will be relevant; it’s good exposure for their company; dinosaurs are a hot ticket item, and their association with them will bring more money to the company. As soon as the carnage starts, though, the focus does not shift to loss of human life: the first thing everyone thinks about is how swiftly the lawsuits will come, and how everyone is going to be out of a job in the morning. All efforts are made to contain the Indominus Rex rather than disrupt the viewing experience because if word gets out that people are dying or in danger, the park will lose a shitload of money, and nobody wants that. It’s this scenario that provides a perfect combination of just why this disatrous idea of a theme park keeps getting green lit despite that we all know it’s a terrible idea: people are willing to pay a lot of money in order to feel like they have power. This is not a new concept: Eli Roth took it to the extreme in the Hostel films, with individuals paying top dollar in order to control someone’s torture and death. It’s the same thing with Jurassic World: as dumb as it is to think that Chris Pratt can control a gaggle of Velociraptors by holding his hands in a stop position, we buy it because we like to think that we too could have some hope of surviving extreme conditions. As human beings, we want to be what comes out on top. We want to dominate, even if it means that someone else is going to get killed in the process. We all secretly hope that we’re going to be part of the survivors that make it off the island rather than become part of the inevitable doom fest that’s a dinosaur’s next meal. It always ends like this. It’s a rather Faustian bargain that we accept with these films: a semblence of power traded for a financial gain. That we keep putting our trust in these films displays how base we really are: we like to see the cool dinosaurs. We want to experience that sense of wonder, of feeling small yet protected. We want to feel like the most powerful thing in the world. And above all, deep down, we really don’t think anything bad can happen to us; that fate’s for someone else.